It's finished! I made up the pattern as I went along, and I am sharing it with you here. If you need some pointers, here are some cool video instructions or you can check out these articles in Knitty for making increases and decreases, picking up stitches, weaving in ends, and using Mattress Stitch and Kitchener Stitch. The yarns I used may no longer be available (Pingouin Pingofrance, 75% acrylic 25% wool, 50 grams 150 yards in peach, orange and purple; and Brunswick Fore-'n-Aft Sport, 100% Orlon acrylic, 50 grams 175 yards in white and pink). You may use any DK or sport weight yarn that knits to gauge. If you would like to make a solid colored sweater, allow 4 (50 gram) balls of yarn to be on the safe side. If you would like to make a striped sweater like the one I made, you'll need one ball each of 5 colors. This is a close-fitting sweater for a baby of 12 months of age. 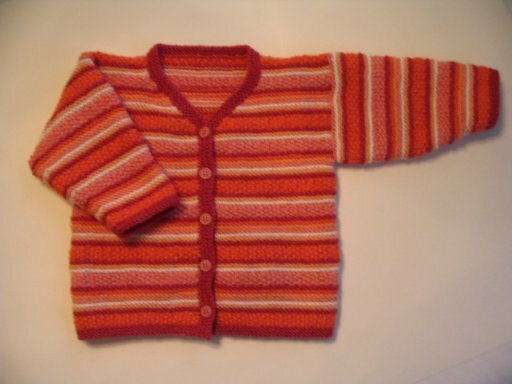 You will also need knitting needles and 5 buttons about 3/8"-1/2" (about 10-12mm) in size. 14" straight knitting needles (or any length circulars if you prefer) in US sizes #2 and #3 (2.75 mm and 3.25 mm or UK/CAN #12 and #10). Gauge: 23 stitches x 46 rows = 4" (10 cm) in garter stitch. These measurements have been taken from the actual sweater. The Pingofrance yarn band says 23 stitches x 30 rows using US#3-4 needles. I used the 3's because I tend to knit loosely. I did a swatch first in a single color in garter stitch over 30 stitches and 60 rows to make sure that I had at least 4" of knitting in both directions. Do take the time to check your gauge if you want the sweater to be a specific size. The bigger the swatch the better. If you aren't picky about what size it turns out to be, then you can live dangerously and just knit it up using the needles recommended on the yarn band. As long as you are using yarn of the same weight and you are getting a gauge close to mine, then you will have a sweater that can be worn by someone's child. If you stray too far from the gauge, you may end up with a sweater that has bad proportions and will be disappointing. How close is close enough? If you're getting about 6 stitches to the inch, you'll get a size 12 months sweater (chest about 22 inches). If you're getting about 5 stitches to the inch, you'll get a size 18 months sweater (chest about 25 inches). If your gauge is about 7 stitches to the inch, you'll get a newborn size sweater (chest about 18 inches). I don't recommend straying beyond that range without some adjustments. 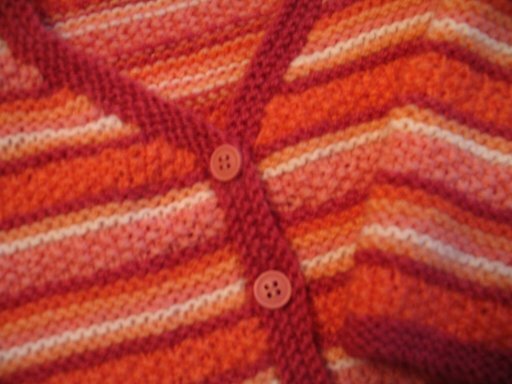 I knit the body of the cardigan in one flat piece, then knit the sleeves separately. I chose not to knit the sleeves in the round in order to avoid having an obvious jog in the stripe pattern, since sewing the seams to make the garter stitch stripes align neatly is easy to do. When making stripes, carry the yarn along the side of the work, twisting and wrapping the yarns every other row to secure them as you go along. Instructions are given for unisex or boys style sweater (buttonholes placed on wearers left front) with instructions for girls style (buttonholes placed on wearers right front) given in brackets where needed. Garter stitch: knit every row. Seed stitch: On even number of stitches, Row 1 *knit 1, purl 1* across row. Row 2 *purl 1, knit 1* across row. A note about the stripes in my sweater: I used this color progression, that I copied from the photo in Candace Key's article in Knitty *6 rows seed stitch in color 2, 2 rows garter stitch in color 1, 2 rows garter stitch in color 3, 2 rows garter stitch in color 4, 2 rows garter stitch in color 5, 2 rows garter stitch in color 3, 2 rows garter stitch in color 2, 2 rows garter stitch in color 1, 6 rows seed stitch in color 5, 2 rows garter stitch in color 4, 2 rows garter stitch in color 3, 2 rows garter stitch in color 1* repeated continuously. Body: Cast on 122 stitches using US#2 needles. Knit 5 (6) rows garter stitch. Change to US#3 needles and continue in stripe pattern or plain garter stitch for 72 rows. Right Front [Left Front]: Knit the first 31 stitches in pattern. Place the next 60 stitches on a stitch holder for the back. Place the last 31 stitches on another stitch holder for the left front [right front]. Continue working the 31 stitches on the needle in your chosen pattern for another 15  rows. Start decreasing 1 stitch at neck edge every other row for the next 28 rows. Knit the remaining 17 stitches in pattern for 10  rows. Bind off. Left Front [Right Front]: Take the 31 stitches from stitch holder and place them onto knitting needle. Work in pattern for 16  rows. Start decreasing 1 stitch on neck edge every other row for the next 28 rows while continuing to knit in pattern. Knit remaining 17 stitches in pattern for 10  rows. Bind off. Back: Take the 60 stitches from stitch holder and place on knitting needle. Work in pattern 54 rows. Bind off. Sleeves: With US#2 needles, cast on 36 stitches. Knit 5 rows garter stitch. Change to US#3 needles and knit in pattern, increasing one stitch on each side of the sleeve every 6 rows, for a total of 54 stitches. Continue working straight until 5 rows ribbing + 80 rows pattern have been completed. Bind off. Work second sleeve just like the first. Assembly: Sew shoulder seams together using kitchener stitch. Sew sleeve seams using mattress stitch. Sew sleeves to armholes using mattress stitch. Weave in yarn ends. Neckband: Starting at the wearer's lower right front edge of the sweater, pick up 47 stitches along the front, 18 stitches along right v-neck edge, 5 stitches along right side neck, 26 stitches along back neck, 5 stitches along the left side neck, 18 stitches along left v-neck edge, and 47 stitches along left front edge. 166 stitches. Row 1: Knit across row. Row 2: Knit across row. Row 3: Knit 106 stitches, *YO, K2tog, knit 9* 5 times, knit 5. Row 4: Knit across row. Bind off. Weave in ends. Sew on buttons opposite buttonholes. Add one more part for the cuff 'ribbing' and bands (I used color 1, purple). I estimate there are about 5 parts in a ball of this yarn, or about 30 yards per part. This sweater can certainly be knitted using only one size knitting needle, it just looks a little better if you knit the bottom and sleeve edges (the 'ribbings') a bit tighter than the rest. Edit: Here are the directions to add a hood to this sweater! Knit the fronts without shaping the v-neck: you will have 14 extra stitches on the neck edge. Don't bind them off with the shoulder stitches, instead place them on a stitch holder or a bit of waste yarn. When knitting the back, bind off the first 17 stitches, place the middle 26 stitches on a holder, and bind off the last 17 stitches. Knit the sleeves and sew up the sweater as usual, leaving the extra stitches on the fronts and the center back on holders. Place these 54 stitches onto a knitting needle and continue knitting in pattern, increasing 2 stitches in the middle of the row every 2 rows 8 times; 70 stitches. Continue knitting in pattern until hood measures about 6.25 inches/16cm (about 72 rows). Next Row: Knit 35 stitches, fold the hood in half and either 1. perform a 3-needle bind-off or 2. sew the left and right halves of the hood together with kitchener stitch. The neckband: Pick up 47 stitches along the right front, 36 stitches along the edge of right side of hood, 36 stitches along the edge of left side of hood, 47 stitches along the left front edge: 166 stitches. Proceed as directed to finish. looks fantastic! thanks for the pattern. great job! I love it! So stripey and good!!! Good job! It's very nice of you to share it on the web. Thanks! Wow--so very cute! Thanks for sharing the pattern. I'm living in Germany for a few years and having trouble finding knitting patterns in English. I've just started your baby sweater pattern and it's shaping up very nicely. Thanks for the great Blog! Thanks so much for the pattern using Pingouin yarn. I just bought some over the internet and was wondering what to knit. Now I know. The sweater is adorable! Thank you so much for sharing patterns that actually make up beautifully with us inexperienced knitters. I changed the colour scheme to work for a little boy - it turned out perfect!! Thanks again! It looks beautiful - any idea how to add a loose hood to it? Yes, as a matter of fact, I do know how to add a hood to this sweater. I have added a section to the end of the pattern post explaining what changes to make to the fronts and back are needed and how to knit on the hood. I love this pattern! I'm going to make this for a co-worker, but I've picked some other colors. I hope it comes out as beautiful as did yours! Many thanks Ari for this beautiful looking cardigan. I am going to start this now for my grand daughter. With thanks and best wishes, Irene, Dublin, Ireland. Actually, your pattern is not correct if knitting a newborn or smaller size. You say that if you are getting 7 stitches to the inch, you will get a newborn size However, as the pattern is written, it is way too long. You should adjust the length accordingly. Thank you for voicing your concern. Estimating a gauge of 7 stitches and 14 rows per inch, my pattern produces a garment with a body length of 9 3/8" from shoulder to hem and a sleeve length of 6" from underarm to cuff. My collection of commercial pattern measurements varied quite a bit in length, and my pattern fits in at the longer end of the range. So, it isn't too long as far as garment industry standards go. However, some people may find the finished sweater to be too long for their baby. The sleeve and body length can be shortened by an inch and still make a well-proportioned sweater. Before shortening the pattern, do make a tension swatch of your yarn first, because sometimes you can end up with a garter stitch row gauge that is more than twice the stitch gauge, and this will make the finished garment shorter. I tend to choose patterns with proportions that are long and narrow because that's the way the babies grow in my family. Many ready-made garments are too wide and too short to fit my kids. If you have the same trouble, I recommend Bouton d'Or, Anny Blatt and Pingouin patterns because they seem to fit tall and slim kids better. MISSION FALLS COTTON VERY SWEET! Thank you so much for posting this design ... I made a beautiful sweater for by baby nephew. It was my first knit sweater, and your pattern was so easy to follow! Please pardon the dust, we're doing a little remodeling here. Blogwear from The Shabby Princess.